Joslyn Art Museum will offer free admission for everyone Thanksgiving weekend: November 25-26, 10a.m.-4p.m. and November 27, noon-4p.m. Guests can enjoy the permanent collection galleries and these special exhibitions: American Landscape: Contemporary Photographs of the West; From Sea to Shining Sea: Currier & Ives Prints from the ConAgra Foods Collection; and Wendell Minor: In the American Tradition. 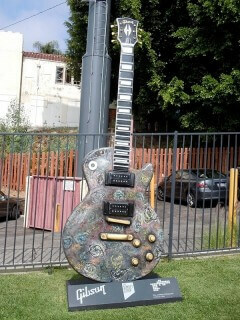 Benson-based artist Mads Anderson was one of 26 selected national artists to create a 10-foot-tall fiberglass Gibson Les Paul guitar for “Guitar Town Sunset Strip,” a public art project in Hollywood. The guitars were unveiled in August 2010. Anderson’s, entitled “Timescape,” along with the rest will go up for auction December 3 at Julien’s Auction House in Beverly Hills with all proceeds benefiting the Gibson Foundation, “committed to making the world a better place for children by creating, developing and supporting programs and other non-profit organizations in their efforts to advance education, music and the arts, the environment and health & welfare causes.” Anderson is attending the live auction and created a website for the project at madsanderson.weebly.com and the auction booklet can be found at juliensauctions.com. November 27, Nebraska Women’s Caucus for Art will host a closing reception, 1:30-3pm, for their Pandora’s Box show at Hot Shops Art Center. Participating artists created a small jewelry box in the style and medium of their choice.